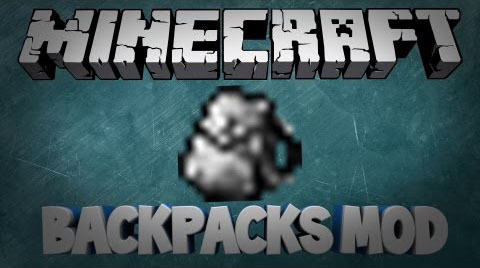 Backpacks Mod is a simple mod which adds backpacks into Minecraft. So, to make a backpack you have to first make the leather backpack. This works as a normal backpack but if you like you can also dye your backpacks with any of the dyes. To open hold shift and right click. They are shapeless recipes and only require one dye. You can also dye already dyed backpacks and wash them to get back to the leather look with a bucket of water. 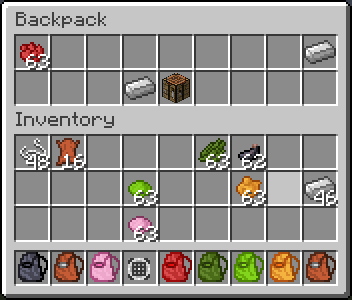 The Gui of backpacks has 18 slots to put your items. Also be aware that you can’t put backpacks in backpacks. 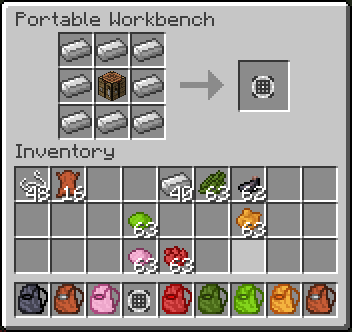 As an added bonus this mod adds in a portable workbench which crafting recipe and what the Gui looks like is below. To open hold shift and right click.